I teach Nia at Community Centers in San Jose. One of the things about community centers is they are for the community. During the summer that means that they are kid central. It is amazing all of the programs they have for kids during the summer. It is so great to see the centers doing so much to keep the kids learning and active during the summer. What a full community center sometimes translates to is regularly scheduled classes get shuffled around. I was given about six months notice for this summer’s shuffle. So our Nia class was prepared. I had been telling them since January. Then I put up a notice in June. So we were aware. It is a huge blessing that we just get moved to another room and not to a different time or cancelled altogether. I am grateful that we still get to have a class while all these summer camps and kid fun is going on. It is working out to be one week a month. Last month the room we were moved to had the portable mirrors in the closet so we were able to roll them out and use them. Today the closet was full of tables and chairs. The mirrors were nowhere to be found. The center is on what used to be a high school campus. So it is very large and spread out. I wasn’t certain that 25 minutes would be enough time to let someone know about the situation, find the mirrors, and move them all the way across the campus. So we did Nia without mirrors today, using the opportunity to focus inward. In a Nia class the teacher stands with her/his back to the students. One way we connect with our students is eye contact in the mirror. A Nia teacher can turn and face the students. In fact, it is recommended at times to do so to change things up and to connect in another way to the students. We even practiced it in the Blue Belt Intensive. So it is up to the teacher to teach facing whichever way s/he wants. Generally though we face away from the students. Facing away makes it easier for some people to follow since we are moving the same side of the body and going in the same direction as opposed to the mirror image as was (and possibly still is) done in Jazzercise. What I find is that I learn the routine SAYING it as if I am teaching with my back towards the students so for me to turn around I would be saying go left as I move left and we would not be dancing in mirror image. So to turn and face the students while we are doing a dance that moves front or back or laterally is a challenge for me. Especially when it is a new routine. And right now, I am somewhat learning a routine. In a routine there is usually a song or two where we are not moving left or right so we often face each other than. I was able to do that today, but some I did with my back to them. I think dancing without a mirror every once in a while is a good thing. It helps the students dance with themselves. The moment I found out we didn’t have mirrors I knew our intent and focus. I set the focus to be the Conscious Personal Trainer, with the intent of being fully aware of and sensing your own body’s movements. Without the mirror to distract us I thought it would be a great opportunity to focus more on one’s own body. Without the mirror we don’t see ourselves nor the other people. Without a mirror the possibility to draw ones attention in and keep it in seems better. So, of course, I was very happy when one of my students said that dancing without the mirrors made it different. It did allow her to focus more on her movements. She said she was less distracted with the other students. Yay! I like that it worked for her. I like that we were able to do it different, but we still danced and had fun. I am very blessed to have such great students that can just go with the flow and DO Nia! It is nice to have “no mirrors” give us the opportunity for something different. When you take a lead-follow exercise class do you prefer the instructor FACE your or face away from you? Last week I cancelled my Monday and Wednesday Nia class and got a substitute for my Tuesday Nia class with the City of San Jose. I decided to take the next level of Nia training. I was a White Belt, now I am a Blue Belt. Nia calls their trainings intensive. I cannot assume to know why, but I am glad they do. They are very intense. The training is part lecture and part moving. The moving can be dancing or types of exercises to further the learning process. People tend to learn better when they are doing, so there is a lot of doing. In my rough calculations it was about 53 hours of instruction, including the Master Classes. It was Saturday through Friday. It was exhausting. It was energizing. It was incredible. As I have mentioned before and I will continue to mention Nia is a cardio dance exercise. Come to a class. Move. Have fun. Sweat. Get your workout in. But Nia is also a practice. I compare it to yoga in that a person can go into a yoga class and work out and do the exercise and then leave and not give it a second though. Or they could give it a second thought. They could take on some of the aspects of yoga, they could practice breathing and/or meditating or anything else that might be attached to their yoga class on a deeper level. That is what a person can do with Nia too. So some people take the intensives for self-growth with no intention of teaching at all. Even if they are not planning on teaching or are not currently doing so, the training is just as intense. Each belt level has its own focus and intent. 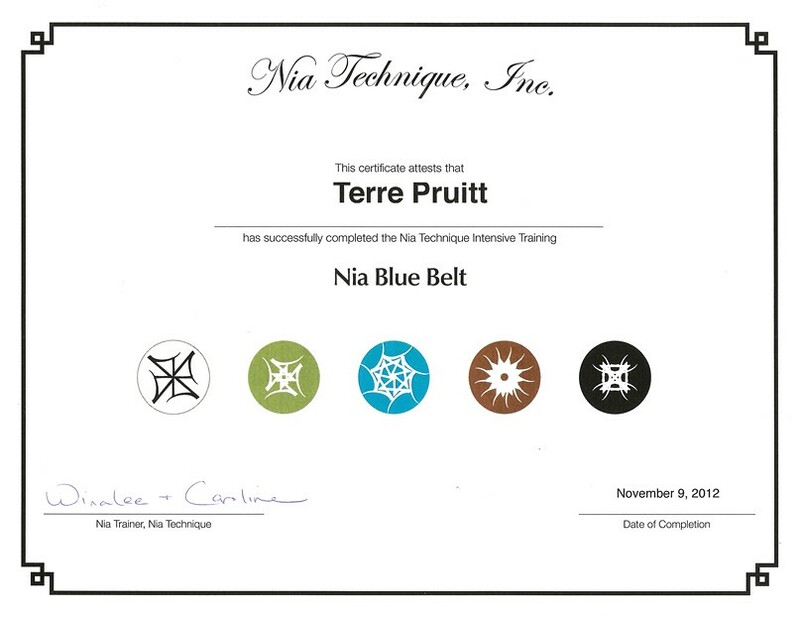 Blue Belt focus is Communication, Relationship and Intimacy with the intent to energize personal connection through self-discovery and communication by following The Body’s Way. Sounds like a lot. Ok, it IS a lot. LOL! In addition to a focus and intent, each belt level (aside from Green) has its own set of principles. With the Blue Belt, the principles were made to layer onto or over the White Belt Principles. Some of the information is very close to being the same, but with a little more added to it. It is very interesting the way Nia does things. It is very amazing the training they come up with and the delivery of it. In this training we were shown many things, one was an enlightened way to use the Nia 5 Stages or the Developmental Anatomy to measure all types of things and where we might be in a process. It is a pretty cool tool. It is part of the Body’s Way. I am 100% positive I will have more posts regarding the Blue Belt Intensive, the Blue Belt Principles, and my thoughts on it all. I am still processing it right now. My mind is racing with thoughts, ideas, things I learned, things I didn’t learn, just a lot of things. There is so much that I want to share. There is also a lot I don’t want to share. Nia is not a secret society by any means. There are no secrets to the intensives, in fact most of the information is things that have been around for as long as I can remember. The information is stuff you have probably heard before. It is just the WAY they deliver it. And the way it is connected to the body that is somewhat unique. If I decide not to share something or talk vaguely about some things it is because I don’t want to ruin the surprise of some things for those of you that will be taking the Blue Belt. Since the Blue Belt Principles are layered onto the White Belt Principles I will probably write more post about them too. And we will see what comes up. I have chosen to participate in Nia as a practice. For now, I will revel in Blue! Is there something that you have in your life you consider a practice? On Wednesday after my Nia Class in San Jose I was talking to one of my students. Some how we ended up on a subject that had her telling me about a friend of hers who is blind but has no issue navigating the step that is not too far from her front entry way inside her home. She was explaining that people have no problem with it on the way in, but on the way out they forget about it and usually stumble on it when leaving the house. This led to many other tangents in our conversation but one thing it had me thinking about was sight/seeing and our focus. I was thinking that the sighted people were focusing on the door on the way out of the house. For me, I imagined myself leaving her house, part of my focus on her and saying our goodbyes, then another part on the door—–but with the door a multitude of other things would come into my mind and into my focus. I would see the door and begin to think about my car, which would make me think about my drive, which would lead me to think about what I need to do on the way home, which (depending upon the hour of the day) might have me thinking about what to cook for dinner and if I needed to stop at the store on the way home—-all of which would make me trip. I would not be focused at all on my feet and on the step and I am sure that I would stumble into the door. With that in mind I had a focus and an intent for my next Nia class which was the one in Los Gatos. The focus was Awareness, the intent was to connect to one’s body. While I have used awareness as a focus before, and I have probably even used the same intent before, and I have even invited the participants to close their eyes, this time I did it more frequently. With this routine there is a song where we are completely stationary so closing one’s eyes to allow for complete focus on one’s body is perfect. There is also a song where we turn and face different walls (in line dancing it would be called a four-wall dance). When we turn it often takes me and other people out of the line of sight which can often lead to one “having” to be aware of one’s own body. To me one of the fundamentals of Nia is being in one’s body and dancing in your own body’s way, but I think that we often get distracted by the things we see. I know that while I teach sometimes I will get distracted because I see my hair sticking up or I see something else I should not be concentrating on. So I think that having Awareness, with the intent of connecting to the body and adding “eyes closed” to be a great tool. We did not dance the entire routine with our eyes closed, just when it was safe to do so, when our movements were not far from our spot and there was no chance of bumping into someone. Also, it was just an invitation to assist with the focus and intent it is not something that was required. As the teacher I do not close my eyes as much as I would if I were the student because I am teaching and making certain that all is well in the class, but I know that the few times I did I was able to really embrace the focus and the intent. What do you think? Do you think that if you close your eyes you can focus more on your body? I am so excited and intrigued by the Dance Anywhere idea, I wanted to blog more about it. It is happening tomorrow (Friday, April 24, 2009 at noon PST), so I suggest you adjust your schedule and put it on your calendar. Just think the world could look like those train station videos. Have you seen them? Ok, so the world probably won’t look like those videos, they are obviously choreographed and probably rehearsed, but so what? How fun would that be? If you look at Beth Fein’s site you will see (http://www.danceanywhere.org) that there are videos and pictures of past events. There are people dancing on the street, on hiking trails, in homes, and all over the world. Unfortunately I won’t be in San Jose, where I am confident the earth will be shaking (from the collective dancing), I am going to be driving to a Nia Intensive I want to audit. But I did register so I am planning on dancing in my car. The tricky part is going to be the picture . . . . hmmmm? Maybe at noon I will have to plan a stop. I can dance where ever I stop! I think that is it! What about you? Where are you going to be? Where ever you are, stop and dance it doesn’t have to be a big dance, just join us!